When I first ran across this book, I was skeptical. The positive comments on the dust jacket that the recipes really work convinced me and I tried them. I was surprised when all of the recipes worked (the ones I tried, anyway). I now regularly make chocolate desserts from this book and freeze them. Being able to just take something rich and chocolaty from the freezer, thaw, and eat is something not to be missed. Cookbooks written in the 1960's and 1970's used to routinely include instructions for saving and freezing the recipes. This is not true of recent cookbooks. This is a shame, as it a great labor saving technique. The home cook would make a spectacular dessert on a lazy Sunday afternoon or in lieu of a cancelled weekend activity, and freeze it for later use, mainly during the weekdays, when there is no time to properly bake a nice chocolate dessert (not to mention midnight raids for a snack). It is also an excellent way of preparing for parties and such. This book happily brings back this old-fashioned tradition our mothers used to practice regularly. I find 2 factors in this book rather quirky. First, the author recommends melting chocolate in a warm oven, then turning up the heat for the baking. Better methods are the microwave (the author states that she does not have one) or in a double boiler. You also must have a large stand mixer; there are no alternate insturctions for doing the recipes manually. There are some curious errors. This book should have been vetted by a test kitchen. Some of the recipes should involve the use of tempered chocolate (chocolate curls), yet no mention is made of how to temper chocolate or the use of vegetable oil based "summer coatings" (I skip these recipes; there are better ones for making and using tempered chocolate). Some of the recipes involve a dramatic visual presentation (chocolate-covered raspberry mousse mountain), yet there is no picture of the finished product. The instructions for freezing are not a part of the recipes, but are mentioned in sidebars, leaving the cook to guess as to how include the freezing instructions into the recipes. For the most part, this is not a problem, but it can lead to confusion in some recipes. They should have been integrated directly into recipes. This was a good book!!! This book was good i found it had alot of stuff to help me with making and choosing the right chocolate to use!!! The chocolate is a part of our world and we should all try it once and a while!! !The world has had its eye on chocolate and i think u should put some chocolate into your life! So that brings me right back to this book chocolate is the best thing to experiment on with how to make it you should try it once in a while!!! I made some chocolate and it was my first time and it just tasted delicious!! So if your a chocolate lover(like me) than you just have to read this book!!! 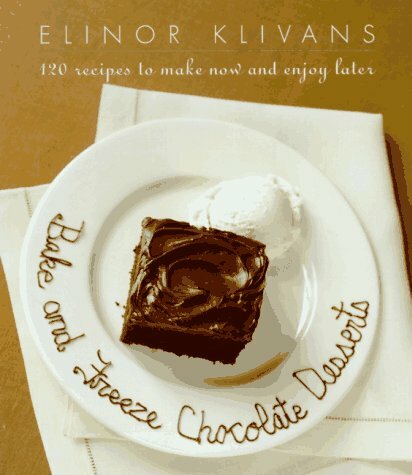 A "must have" chocolate dessert cookbook! As the holidays loom nearer, there's nothing like having a few desserts in your freezer on hand for those unexpected guests! The recipes are well written and easy to follow. And the freezing/thawing directions are very helpful, too. Plus, the author gives very good descriptions of specialty ingredients and where to find them. 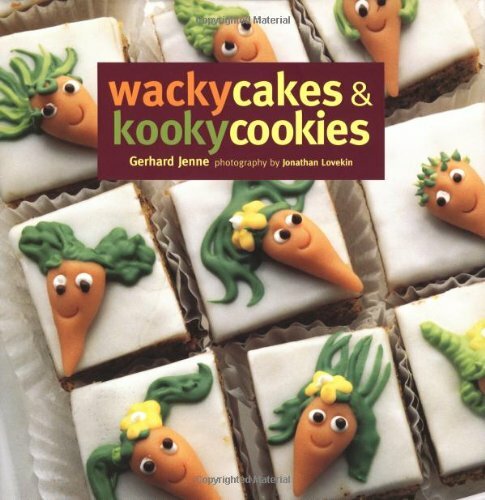 This book makes baking fun! These desserts are yummy and a cinch to make. The author's directions are easy to follow and she anticipates any questions you might have. This is easily the best dessert cook book I have found. This book makes baking fun! If you only buy one cookbook, this should be it!! I cook extenstively and own a wealth of cookbooks but when I want to make a failsafe recipe, this is THE ONE. Not one dud to date (there is no other cookbook I can say that about). Always worth the effort. If you only buy one cookbook, make this it, you'll never be sorry. Let's face it: most cookbooks have maybe two or three recipes you incorporate into your repertoire. I must admit the Culinary Institute of America imprimatur put me off (I'm a *cook*, not a chef, and I associate the CIA with the Arugula Heresy and the California Cuisine Abomination). This, along with Beard on Bread, the original troika of Mastering the Art of French Cooking, Marcella Hazan, and various Louisiana and Chinese cookbooks has definitely got a permanent place on my shelves. I've tried 10 recipes so far from the various categories (Broths, Hearty Soups, Cream Soups, Pureed Soups, Bisques & Chowders, Cold Soups) and not only haven't found a dud, but have been brought to food overjoy. I admit that I've chosen with an eye to avoiding stuff I don't like (like split pea, which traumatized me as a child, or puree of carrot & orange, which simply sounds vile to me, rather than intriguing -- the California Cuisine Abomination again). With a Cuisinart or similar appliance, none of these things are very hard, especially if you keep stocks around. If you don't, buy a package of stock at your grocery store, which I do when I don't have the time to roast and simmer. 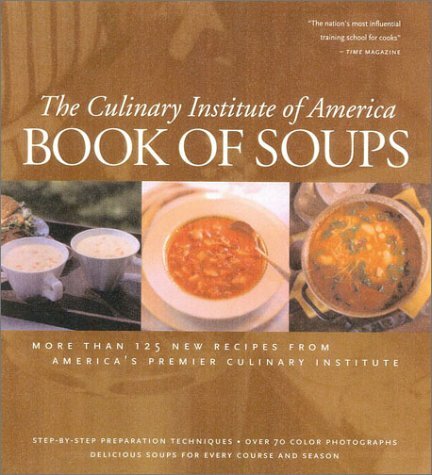 I've seen more specialized books (there's one very good one devoted to chowders, whose name escapes me right now), but this is the best general-soup book I've used. I haven't tried many of these recipes yet, but the ones I have were fantastic. The Potato and Fennel Chowder, in particular, was exceptional. My husband, to whom little is better than "pretty good", asked for a double batch the next time! The instructions are pretty clear and easy to follow, and it's just generally a nice book to have around. These two study guides were quite on target with the kind of questions asked on my baking exams in my culinary school. These 3 books get my highest recommendations. Complete, accurate, and very tasty! I finally found the perfect candymaking book! This book has recipes for every kind of candy I have ever wanted to make. The pictures are beautiful and the recipes are very easy to follow. 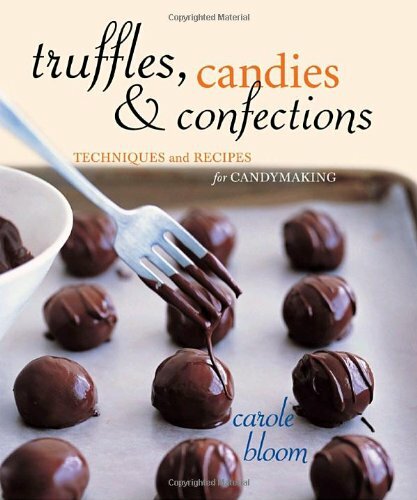 The best part is that every recipe I have tried has turned out!For anyone interested in candymaking, I HIGHLY reccomend this book! If you like fondants and chews, this book is for you. The pictures help the beginner and the recipes are what you're looking for. I was so pleased with my first candymaking experience thanks to these ladies. A good "first-book". This is the very best candymaking book I have ever own. I was a little skeptical after reading Eileen's review, but as I read the book, it explains why you use evaporated milk in SOME caramel recipes--it is so the caramel will hold it's shape. Not all caramel recipes in the book use that, just some of them. Some milk solids are necessary, along with the cream. I found the chocolate section wonderful! The authors explain in detail how to select, melt and dip chocolate. I followed their directions and had wonderful success. It doesn't claim to be a European candy book, just a good book to teach you how to make wonderful candies. Thanks ladies! Disclaimer: I have not made any of the recipes in the book. Like another reviewer, I was put off by a few things. Caramel recipes call for evaporated milk - not fresh heavy cream - and that alone is enough to discourage me. Where is the discussion of types of chocolate, instructions on tempering chocolate before using it in coating, and recommendations of fine brands such as Callebaut? This book might be acceptable for someone who just wants to produce some sweets to enjoy at home, but for a serious chocolatier, or someone who aspires to be one, it leaves much to be desired. I think it is not worth the trouble to make chocolates unless one aims for the finest quality. I was looking for a book that will teach me to make fine European types of chocolates, and I am still looking. The pictures are pretty, and I will probably try one of the fondants (the fresh raspberry fondant recipe might be worth trying), but that's all I got out of this book. 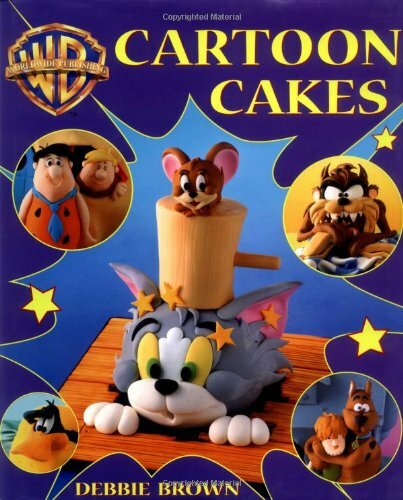 Before this book, I was fondant challenged. With this book, I have been cured. I can finally make a tasty fondant for dipping in chocolate. This is a great book. Follow the directions and the recipes turn out great. The book has numerous tips and secrets to making good candy. The book covers a wide variety of candy types. It also covers a wide range of recipes for different skill levels. Some are very very simple. Some require skill. The recipes let you know before you start the level of difficulty. Personally, I think the carmel recipes are the best. However, I am sure everyone will have their own personal favorites. Leslie Mackie opened the Macrina Bakery & Cafe in 1993, specializing in hearth-baked artisan loaves and rustic European pastries. An expert baker, Leslie Mackie's recipes have been featured in Bon Appetit, Sunset Magazine, and The New York Times. 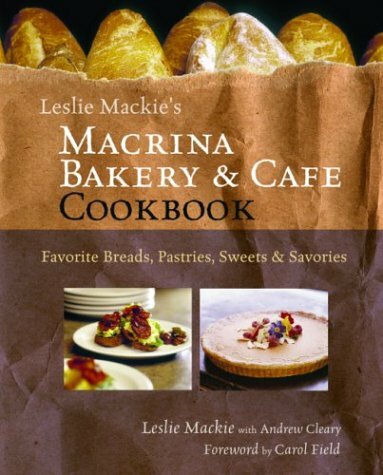 Now, with the assistance of Andrew Cleary, Leslie Mackie has drawn upon her expertise to compiled the Macrina Bakery & Cafe Cookbook showcasing her favorite breads, pastries, sweets and savories. From Guatemalan Hot Chocolate Bread; Raspberry Cinnamon-Sugar Bread Pudding with Nectarine Compote; Chocolate Cherry Pound Cake; and Lemon Chess Tart; to Sour Cherry Shortbread; Gingerbread Crepes with Citron Ricotta, Cranberry Compote & Vanilla Syrup; Tuscan Tomato & Fennel Soup with White Beans; and Steamed Chocolate Pudding Cake, Macrina Bakery & Cafe Cookbook is a gourmet's delight and very highly recommended for personal, professional, and community library cookbook collections. The porcini mushroom loaf is just the bread for a melted fontina sandwich. Recipes were clear, user-friendly and delicious. Not sure I would do the breakfast bread pudding again (with sausage, cranberries and goat cheese), but there are many other wonderful recipes to try. Best of all, visit Macrina in Seattle and eat for yourself! I used to stop in on the way to work or on the way home for bread; it is always a treat. The resemblance of the cartoon characters that are crafted in cake is simply unbelievable. The designs look very intimidating at first, bu once you get over the first hurdle and just start, you will find that with the concise step-by step instructions and many pictures, you can't go wrong. Be prepared to spend many hours on a cake, and be prepared to get a standing ovation once you present your masterpiece to your public. Chocolate chippers, lemon bars, madeleines, brownies, shortbread, thumbprints, rugelach, biscotti, mandelbrot, and fortune cookies we all love them. We love them even better when they are home-baked. The ultimate comfort food, fresh-baked cookies offer instant reassurance, consolation, and community. One of the reasons we hesitate to bake cookies is that all too frequently we discover that we don¹t have all the ingredients we need (or we don¹t have enough time to bake them from scratch). Cookie Dough Delights conveniently solves both problems. Its easy recipes will tempt everyone back to the oven with an assortment of delectable home-baked cookies (and a smattering of other mouth-watering desserts), all of which begin with an 18-ounce roll of refrigerated cookie dough from the supermarket dairy case. In Cookie Dough Delights, cookie baking expert Camilla Saulsbury showcases more than 150 delicious cookies, bars, and other treats, each of which is made from refrigerated cookie dough! These thoroughly "kitchen cook friendly" recipes range from Peanut Buttery Chocolate Chip-Loaded Cowboy Cookies; Cardamom Currant Tea Cookies; Ginger Lime Biscotti; and Italian Cheesecake Bars; to Lemon Tassies; Viennese Almond-Filled Cookie Tart; Cookie Tiramisu; and Deep-Dish Chocolate-Chip Pecan Pie. Of special note is the section entirely devoted to frostings! Feel like making some terrific cookies the easy way? 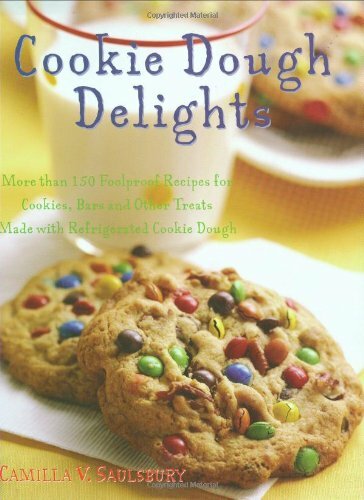 Then get hold of a copy of Camillia Saulsbury's Cookie Dough Delights! For all the times you are strapped for time but (pick your situation): have to bring dessert to a pitch-in, bake cookies for your children's school event (at 10 o'clock the night before! ), have to make something to share for the after-church reception, want a pretty dessert to serve to guests, or have a major cookie craving, you will be happy you have this book. Love it! I'm going to stay in the same theme as the recipes and keep it simple: I love this cookbook. If you, too, are a cookie monster (or partner or children), you'll love it too. What a gem--I really love this cookbook. It has already gotten more use in 3 weeks than the majority of my cookbooks (especially baking books) have gotten in years. There is a full range of recipes--ones that kids will love (I can testify--my kids do. They loved the chocolate-dunked toffee chocolate chippers) but also great ideas for entertaining (the tarts and cheesecakes, for example) and tea-time (e.g., biscotti and tassie-style mini-tarts). But all are easy and the instructions are clear. This cookbook is a real treasure. The recipes are delicious, the writing is friendly and reassuring, and the directions are easy to follow. I strongly urge new bakers, in particular, to give this one a try-you can make some wonderful recipes without being intimidated. One of my new favorite cookies has only three ingredients (chocolate chip raisin cookies laced with cinnamon). I bought one tube of dough (on sale for $1.89) since I already have raisins and cinnamon-in short time I had about 2 and 1/2 dozen cookies that tasted better than what I could buy at my local coffeehouse. And the house smelled wonderful, too. I agree with a previous reviewer that this could be a fun one for kids-just finished ordering copies for my godchildren who are getting curious about baking. Another thing that I am excited about with this book, and is something that the other reviewers have not mentioned, is that it is good for people who live solo (or perhaps empty nesters or other couples) who do not want to be tempted by having dozens and dozens of cookies around the house. I gave the book to a dear friend shortly after receiving mine (she still likes to do some occasional baking) because I know that she buys the tubes of cookie dough on occasion to satisfy her sweet tooth. She is thrilled with the book and has already made HALF batches of two of the recipes (don't have to worry about halving the leavening as you might if making from scratch). 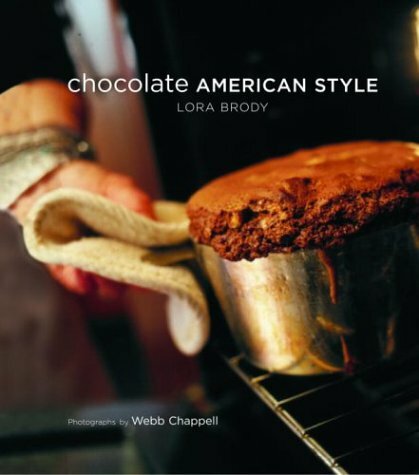 Having confessed her jones for chocolate in Growing Up on the Chocolate Diet: A Memoir with Recipes Lora Brody celebrates her love affair with the Dark Lord in her cookbook, Chocolate American Style. What she calls American style might best be summed up as, "I want it and I want it now!" To which Lora Brody responds with, "Just how would you like to deliver chocolate to your mouth?" She leaves no chocolate base unturned. Candy? There's an entire chapter (the complexities of melting and tempering are covered in Chapter One, "A Primer for the Home Cook," in which the author spells out what you need and what to do with it, fast and sweet and easy, with the marvelous closing line at the open door, "remember that no matter what your dessert looks like, the fact that you took the time and energy to make it instantly puts it ten pegs above anything you could buy a store."). You might think breakfast was out of the question, Cocoa Puffs aside. To which the author delivers chocolate caramel sticky buns, chocolate chip pancakes with chocolate butter, and chocolate-filled monkey bread. Brody moves through flans, pudding, pies, fudge cakes; through birthday cakes, marble cakes, tortes, and ice cream rolls; through home-made ice cream, fudge sauce, chocolate sauce, and frappe; through Old World faves brought here by our immigrant elders. She tackles pound cakes, cookies, brownies galore, moon rocks, chocolate squares and, Russell Crowe Bars, which border on don't ask don't tell. She encourages in a chapter all its own--"Kids in the Kitchen"--recruiting children to the ways of the Dark Lord. Shameless. And then there's romance. Make that, "Romance." Again, an entire chapter that distills the essence of the romantic gesture into all manner of chocolaty deliciousness. "No one should try to do any serious work with chocolate without reading this book or another equally good book on the subject. One of the first things you learn in this book is that there are as many, if not more subtleties and ambiguities in the marketing of chocolate as there are in just about any other basic food product such as flour or olive oil." This book has an equally skillful introduction to dealing with chocolate. I even believe this book is a better introduction to working with chocolate than the title from Ms. Medrich due to Ms. Brody's exceptional ability to explain potentially difficult techniques. She is especially candid in saying that the first time you try some techniques like tempering chocolate, you may simply not succeed. But, she insists that you keep trying and with due diligence, you will succeed. This combination of clarity and honesty is worth a lot. This book is similar to Gale Gand's book 'short + sweet' in the way it finds a place for itself in your daily family activities with partner and kids. It is also similar to Karen Baker's new book 'Sweet Stuff' in its claiming to evoke a homegrown, American style of chocolate. All three books are worthy purchases that largely meet their objectives. But, they are not the kind of book which grabs you by the lapels and shakes you up with it's enthusiasm or insights or inspiration like, for example Wayne Harley Brachman's 'American Desserts' or Sherry Yard's extraordinary new book 'The Secrets of Baking'. The first crack in the premise of 'Chocolate American Style' is the suggestion that Americans eat more chocolate than anyone else in the world. I just saw a statistic that indicates the English eat three times more chocolate then we colonists eat. Another lapse in the book's premise comes when the author devotes an entire chapter 'Old World - New World' to chocolate laden versions of European classics such as Mandelbrot, Rugelach, Biscotti, Scones, Panini, and the quintessentially Austrian Linzer Torte. Various other recipes also cite French inspirations and how they can show us colonials a thing or two. The final indignity is the recipe devised to immortalize Russell Crowe, which incorporates as many Australian products as the author could fit into one recipe. Like Karen Baker's 'American' baking book, a whole lot of the recipes in this book are author's originals rather than traditional American classics. In fact, one reality of contemporary cookbooks peeks out from some pages of this book in that it becomes clear that a lot of the recipes in the book are neither traditionally American nor written by the nominal author. Several recipes are original contributions by Susan Schwartz who is primarily credited in the Acknowledgments with Emmy Clausing as someone who researched, tested, and fine-tuned recipes. None of these pet peeves diminish the quality of the book. It is not the best book you can get on chocolate, but it is very good in general and especially good for working with families. Like Gale Gand's book, it includes a chapter of recipes specifically written for kids to make. This alone may be worth the price of admission. In fact, it would have been much more appropriate to entitle the book 'Chocolate Family Style'. The kids chapter includes recipes such as chocolate-covered graham crackers, chocolate cereal treats, peanut butter cups, and chocolate caramel popcorn. Makes you glad that chocolate is actually good for you. All the recipes taste very, very good and the author has a genuine, well-recognized talent for communicating them to you. The book does include a number of genuine American classic recipes such as chocolate chip cookies, ice cream cakes, and chocolate ice cream sundaes. Yes, the book also includes recipes for ice cream. Recommended. Some recipes are tough going simply because chocolate is just downright finicky. The author gives you the confidence to believe it will all come out in the end. I am a serious baker and possess many chocolate books. Some of the ancient ones are fine books written by Austrian women with an empathy for the ingredient. Most of the more recent ones are rather pedestrian, pandering to passing (and passe) fashion and are not worth much more than a cursory glance. Some even try to make chocolate recipes low fat!! I must immediately exclude Nigella Lawson from those categories! Jenne has some fun, creative and original ideas for cake decorating. Yes, they do look a bit sloppy, but then these are not the usual "Wilton" frosting daisies and roses. The reason for just 2 stars is some of the recipes aren't very good with questionable instructions. For example, the one for Chocolate Granache calls for UNSWEETENED chocolate and cream. That's it. And it's absolutely vile tasting. I ended up using Jacques Pepin's recipe from his "La Technique" cookbook. And the Konditor cake needs a special Croquembouche mold which will set you back about $90-$110. I think this book is for more experienced bakers who can spot a questionable recipe, but then they probably have better cookbooks in their libraries. I stumbled upon this book in my public library but am looking for a copy for myself. Jenne's base recipes are great no-fail recipes and earned me rave reviews at work when I turned up with shortbread and then the chocolate sponge and ganache. The technique is simple using parchment paper rather than lots of fancy equipment.My attempt at the sunflower cookies was a great hit and was fun. And having fun is the spirit of the whole enterprise. After reading all of the reviews on this book I was left confused by the extreme selection of critiques. After seeing the beautiful carrot cakes on the cover I decided this could hardly be the work of a "sloppy" decorator and went ahead and ordered. What can I say, the cover most definitely does not reflect the level of work inside, which can only be described as ..well.. sloppy! My 12 year old daughter had produced better looking cookies than these!! I can't say anything about the recipes because quite frankly none of them inspired me to try. The only thing that interested me was the explanation on how to make checkerboard or pinwheel cookies, but I didn't need to buy a book just for that. So, if you're undecided about whether to purchase this book as I was, my advice is save your money! Don't waste your money!! Your kids can do a better job than he did! Cupcakes have always been crowd-pleasers at school birthday parties and neighborhood bake sales. But today they are also among the hottest culinary trends for sophisticated adults. 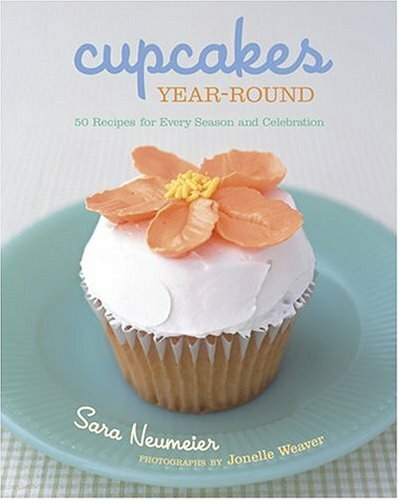 Cupcakes Year-Round offers a platter full of delicious, grown-up recipes-Black Forest Cherry Cupcakes, Hot Buttered Rum Cakes, Carrot and Zucchini Cakes, and many more-along with kid-friendly PB & J's, Snowballs, and Spelling Bee Alphabet Cakes. Clever, fun and easy to use! This book caught my eye and that of my daughter who loves to bake.When we found out that the book becomes a self-standing cookbook, all the better!There is so much imagination that goes into the decorating of these cupcakes!Who knew that a single cupcake could be a spider, an ice cream cone, or a sand castle? The photography is simple, crisp and inviting. I recommend this cupcake book for children and adults of all ages. Cupcake Recipes To Die For!!! The recipes that Sara Neumeier has compiled are magnificent.The presentation itself is yummy eye candy and the actual baked goodies are to die for! This is such a great book.I love it for the recipes, for the fun text & commentary.I like the unusual book-in-an-easel format;it's very creative.It would make a very nice gift for anyone who likes to bake or eat treats. I not only have this book but also have Alices book, Cookies and Brownies. Her recipes are wonderful, from there taste to there beauty! The instruction in the book is easy to follow. 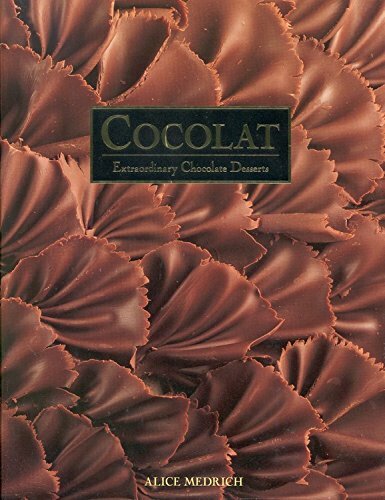 I would recommend this to anyone that loves chocolate (Who Doesn't) One of the other reviews on this book stated that she must have used a machine to make the chocolate ruffles. I was lucky enough to attend a class at Sur La Table (an excellent cookware store) the instructor was Alice herself! We learned exactly how to make the beautiful ruffles by hand. It was not hard and they turned out beautiful. Like with any good cookbook you have to read the instruction carefully. With a little bit of practice the ruffle technique can be done beautifully. You will impress your family and friends with your creations from using this wonderful book. I would recommend highly to anyone wanting to learn about chocolate. BUY THIS BOOK! The story of chocolate from One Who Knows. If you love things chocolate and like to make them, then this is the book you have been waiting for. Personally, my obsession is truffles. I have been searching for years for a domestic equivalent to the bittersweet truffles I used to buy at chocolatiers in Paris, but to no avail. Everything I could get in SoCal was either too sweet, too old, or not chocolatey. I saw this book after looking at three of the author's other books (A Year in Chocolate, Bittersweet, and Cookie/Bars). Surprising, I found my experience with this one to be a bit deflated. It does have beautiful photographs for just about all of the desserts and this is very much appreciated. However, I have seen much of these same recipes in Bittersweet, so this book was a bit of a let-down. I was also annoyed by the author's descriptions of her life experiences in this first book...somehow she appeared self-absorbed, and this was evident even in her last book, Bittersweet- so apparently this might suggest a pattern. Still, she obviously knows her stuff when it comes to chocolate and all of her books are good. I actually have enjoyed the cookie book the most so far. I hope to get a chance to see the one on low-fat desserts. Cocolat is worth a look. This is an interesting book with lots of beautiful pictures of chocolate desserts. Looking at the pictures and reading the ingredient lists should make your mouth beg for a piece of the masterpiece that you are seeing. However, be warned - those who are just learning to make desserts or who those have some skills already (like myself)of making desserts- this book is not for you. First for all you HAVE to have a patient to read the recipe carefully. Since most of the desserts in this book have several components and each of those components needs to be assembled separately (has its recipe of its own - thankfully listed at the end of the book as a separate chapter - "Building Blocks ..."). Second, you will need lots of time and lots of space in refrigerator and freezer as you proceed with your masterpiece. However, all said, the desserts I believe will be heavenly once they will be on a plate, in front of you. Check out your local libraries for a copy of this book before you buy. In 1970's, Alice Medrich was, I believe, the first person to popularize the very rich, dense chocolate desserts that are common today. This book was the first of its type, full of rich chocolate recipes and glorious, color pictures, and it is still one of the very best. The recipe instructions are more reliable and easier to execute than most other chocolate cookbooks, although I have doubts about some of the decorative procedures in the appendix for the average home cook. Whenever I need a chocolate recipe, this is the book I reach for first. Chocolate is notoriously difficult to cook and bake with, and many chocolate cookbooks are equally notorious for their difficult to execute recipes. Medrich is not professionally trained, so you will not find the usual array of vaguely described professional recipe instructions. Instead, you will find procedures of the author's own invention, and these are thoroughly described and easy to follow (in fact, many are unique ones that you will not find elsewhere); I almost never have trouble executing them. The recipes themselves are endlessly fascinating, and I discovered several new things, such as: cake pans do not need to be buttered and floured, the secret to her rich version of truffles, and that a hot milk sponge is better for roulades than a genoise. The only error I found is the recipe for simple syrup (it should be 2 cups sugar to 2 cups water). The appendix, which describes "Building Blocks" and "Finishing Techniques", is more troublesome. The first section has basic components that are used in the rest of the recipes, and you will have to spend time getting the hang of making things like meringue, genoise, or lady fingers. The second half, while not impossible to do at home, is for the dedicated amateur pastry chef only. For these, I suggest that you just skip them; whipped cream in a can, bottled commercial dessert sauces, or pre-made cake decorating supplies from the grocery store are acceptable. The author became famous for her simple, yet strikingly elegant and under-stated decorating techniques; you will miss this element of her desserts, but they will still taste great. Like Goodies, But Can't Eat Fat? A heart problem requires that I eliminate fat from my diet. This book allows me to contine eating a lot of yummy bakery products. I have used a variety of the included recipes, and have been quite pleased. Its great to have delicious, fresh scones for breakfast that contain not a bit of cholesterol or fat in them. This is an excellent cook book for those who need to cut out as much fat as possible (I make many of the dishes for those in my office who have had heart attacks) and with care the baked goods are great. 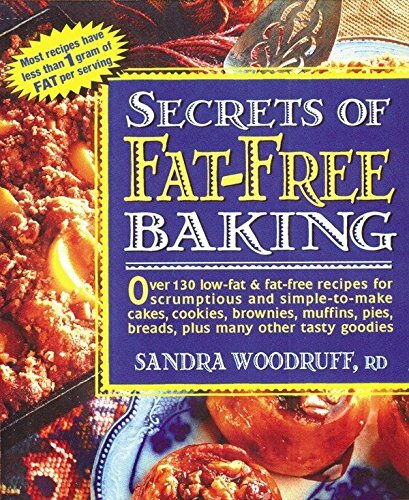 For those who can afford a bit of fat I prefer the recipes in Sandra Woodruff's larger all-purpose Secrets of a Healthy Kitchen cookbook, which use a little bit of oil in the baked goods. Her quick breads are excellent and the muffins really hearty; a great way to start the morning. I own both this book and the larger green cookbook and bounce back and forth between the two, often combining recipe elements and experimenting. Most of the recipes in this book turn out too grainy tasting. My muffins have turned out really tough. Other recipes (such as the white cake with strawberries) weren't even edible. These recipes call for a lot of odd ingredients, too. However, the tips in this book for reducing the fat in your own recipes work great. I've tried them several times with much success. If you buy this book, but it for the tips--not the recipes. Fat free doesn't mean low calorie here. Nor does it mean cholesterol free. Which is an oxymoron in my mind, since cholesterol is animal fat. So how can you have fat free foods that aren't cholesterol free? I'm sure this book is helping others but for someone who was looking for low calorie, cholesterol free recipes, this wasn't the book for me. I've made at least ten of the recipes so far, from lamb stew with spinach and orzo to spicy black bean to lentil with brown rice, and every one has been tasty and straightforward to make, including the vegetarian ones. I cook once or twice a week and eat each dish for several days, so this kind of consistency is important! Note that these are generally not quick recipes in the sense of being able to whip them up on the spot - most I've tried involve throwing things in the pot to simmer at least an hour or two before I intend to eat, and many suggest soaking beans overnight, etc. But the time spent actively preparing the food is usually not that much, and the results have always been well worth it. Enjoy! I just recently purchased this book and have tried 3 recipes so far. They have all been very tasty and easy to prepare, and I especially appreciate that they haven't called for any exotic or expensive igredients but in no way compromise on taste! I highly recommend this book. As a Mom on the run, this book fits my lifestyle. My girlfriend and I love tapas, and love cooking with fresh vegetables from the garden. I got this book hoping to expand our recipe repertoire and find new ways to prepare the spring and summer produce that predominates Mediterranean cooking, like fava beans, tomatoes, eggplant, squash, etc. Little Foods of the Mediterranean did not disappoint. We've already discovered many new favorites among the abundance of recipes offered in this book. The sidebars and other accompanying notes on Mediterranean food and culture are also fascinating, and the author evenhandedly covers the entire region, with dishes representing Spain, Italy, Greece, the Balkans, the Middle East, and North Africa. Although I'm not personally that interested in the antipasti or hors d'oeurves sections, and will probably never prepare any of the more exotic recipes (I'll pass on the pan-fried lambs' testicles, thanks), there are so many other good recipes that I can say I find this book indispensible. This is an absolutely worthwhile cookbook for anyone who enjoys Mediterranean cuisine. I was surprised that another reviewer gave it a low rating because it was not "heart-friendly" enough. It's true that many of the recipes call for dairy products, eggs, or meat, but many of them can be easily adapted with healthier substitutions, and there are numerous healthy vegetarian or vegan recipes if you look for them. 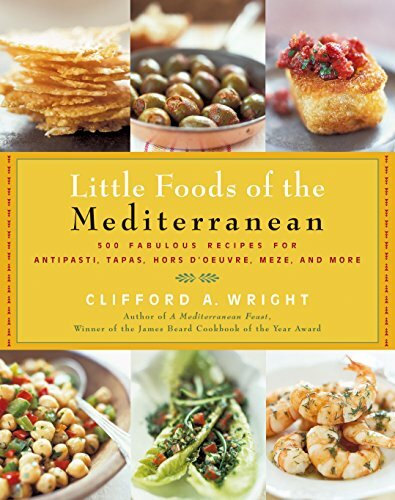 In Little Foods Of The Mediterranean, culinary expert Clifford A. Wright pre-sents and showcases 500 mouth-watering recipes for appetizers and bite-sized servings of all kind, from the rich and diverse culinary tradition of the Mediterranean. Recipes for stuffed vegetables, filled pastries, fried tidbits, kebabs, dips, and many more types of nibble-worthy delights are presented along with fascinating asides about Mediterranean cooking, foods, history, and lore. Little Foods Of The Mediterranean is a magnificent resource -- especially for dishing up morsels to enjoy for ordinary family dining and at special holiday celebrations. I was placed on The Mediterranean Diet by my physician because I need drastic improvement in my cholesterol levels. If you are looking for ways to get started or for recipies, don't buy this book! Although Mr. Wright seems to have a winning reputation and the book is filled with authentic, flavorful recipies it does not relate to heart-based eating. The ingredients include eggs, full-fat yogurt, cheeses, shellfish such as shrimp, and butter. Choosing and buying this book was my mistake; I just don't you to make the same one! You will find it a complete waste of money if heart-health is your goal. Buy The Mediterranean Heart Diet by Helen V. Fisher instead. Clifford Wright is one of the leading writers, along with Elizabeth David, Paula Wolfert and Claudia Roden, on the cuisines of the Mediterranian. This volume complements his monumental, award winning 'A Mediterranean Feast' and is, I believe, as accessable, entertaining, and useable as food writing can get. I confess that this type of writing by a culinary scholar / journalist writing about regional cuisines of the past and present is just about my favorite kind of food writing. Aside from the fact that these people are typically better writers than chefs, I believe this content has a cachet about it similar to what people say of antiques. What has survived from the past is generally better than what is produced today because there is so much more historical product than there is of contemporary product. Things typically survive because they are good. Wright's book fits this expectation to a tee. For $22 list price, one gets over 500 recipes from all around the Mediterranean. This collection is so good, one could easily retire your Martha Stewart and Ina Garten books on appetizer menus and have this take their place. In spite of the superficial similarity in the various small dishes in the book, there is a significant difference between antipasti and hors d'oeuvres, which accompany a large meal, tapas, which often consist of a meal in themselves to accompany afternoon drinking and conversation, and meze, which, in several countries comprise a large meal in itself, based on a lot of little dishes. There are family resemblences between the various little dish cuisines of the Mediterranean but, except for the presence of olives and olive oil, there is probably no common heritage to which all can be traced. Meze dishes can be traced to Arab cuisine. The word appears to be originally from Turkey. Hors d'oeuvre and antipasti are much more recent, emerging in French and Italian cuisines over the last 150 years. Tapas may be traceable to the period of the Moorish occupation of Spain, even though both Wright and Diane Kochalis, an authority on Greek cuisine agree that tapas and (Greek) mezes are different things. All this very interesting historical stuff simply makes the excellent collection of recipes just that much more interesting. The books contents are divided into sixteen (16) types of dishes such as Bread Snacks, Dips, Cheese, Eggy stuff, Saucy Meats, Saucy Veges, Stuffed Vegetables, Salads, Pastries, Pizzas, Fried Turnovers, Fried Tidbits, Wraps, Seafood Salads, Grilled Food, and Pickles and Marinades. This is followed by two chapters of components recipes. One for Sauces and Spice Mixes and one for Doughs and Batters. The book concludes with an extensive list of Party Menus. As you may expect, there are some requirements for uncommon ingredients, mostly cheeses of Greece and North Africa plus spice mixes, including the ever elusive Aleppo pepper. Substitutions from the world of Italian cheeses are almost always possible, but part of the fun is to get the read deal. Internet sources are, of course, provided. In this very large book, I found only one questionable item, where the author specifies fresh plum tomatos or tomato puree to build tomato sauces. On the strength of the opinion of Mario Batali, I would change this to always using canned whole tomatoes. Reading this book just makes my mouth water and it has some history of Italy, with references to just about every spice and tasty combinations. Wow, I ran out and bought a soup pot! One downside, making broth, Uh! Although I will say the book offers substituted canned broth I just don't want to throw these wonderful ingredients into anything less! This is a great book for readers too, I loved hearing about the Famularo family! Not only are the soups tasty and inventive; but they are sensible and nutritious. They require little time and ingredients that are neither exotic, nor hard to find. Most recipe books are loaded with expensive ingredients that necessitate driving 20 miles from your home, and that you use only for one particular recipe. I want recipes that use inexpensive stuff I have on hand, or will have no trouble finding. This book meets those requirements. I read cookbooks like other people read novels, and this is the best cookbook I've ever had. Now that he's conquered the soup pot, Joe needs to move on to pastas and more. I'm not a cook. But during winter months especially, I do make a few soups to help in the household. And this book is the one I usually use as my guide. I need a recipe. I need recipes that are foolproof. And here is where I get them. Not only does every recipe end in a soup that is edible, but one that is tasty and repeatable. That, with this "cook", is downright miraculous! There is variety here, a learning experience, and in the end a soup that is invariably a tasty success. And I'm not even Italian. 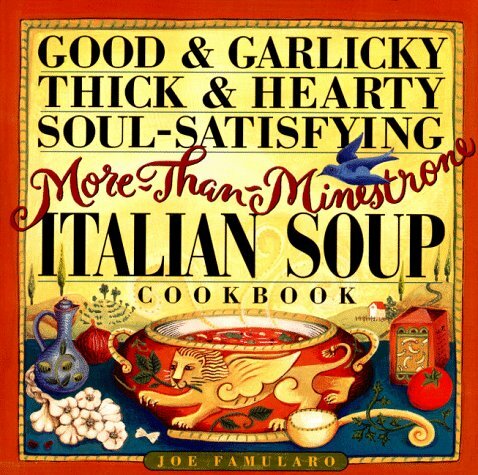 This collection is one of my favorite soup cook books (I have over 20). The recipes are outstanding and the variety is great. Who knew that there are so many different recipes for minestrone? This cook book is the type I love to just pick up and read, and the author includes many warm vignettes or his family memories associated with these recipes. Unfortunately, though, there are no pictures of these excellent soups. 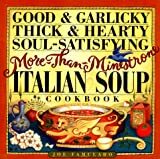 Rich and Hearty Italian Soups!!!! Any excuse to buy another soup cookbook is a good one for me. The large words "Italian Soup" written across the cover was all it took for this one to end up in my shopping bag. Recipes range from amazingly simple to time consuming but worth the work. These are recipes that you'd expect to have passed down lovingly, with each recipient making it their own along the way. There are no pictures in this cookbook but the descriptions do the recipes justice all on their own. Each recipe is listed by its English name, its Italian name shown underneath. Chapter titles, listed English over Italian, appear only in Italian on each page header. For visuals, a decorative green strip borders the page edges and there are drawings done in orange interspersed throughout. A very well done index is also provided at the end of the cookbook. The "Sautéed Asparagus Soup" is a super simple soup that contains so few ingredients you wonder how it could possibly be any good. But it is! I found myself making it whenever I was short on time and ideas. Like most soups, it reheats well and tastes even better the next day. For the most part, soups contained here can be made in under an hour (after preparation of ingredients). "Pasta and Beans with Fennel and Sausage" is great when company's coming and you don't want to have to fix a lot of food. A nice salad served along side this rich and filling soup and you'll elicit compliments and requests for seconds. Soup is typical considered a great food for dieters though with these recipes, I would suggest going over the ingredients lists carefully. Many ask for a good helping of cheese in or on top of. Some use bread, rice, or potatoes as thickeners, the meat-based soups use fairly fatty meats, and butter is used most often to cook in. Nonetheless, it is a fabulous selection, a mind-boggling array of delicious cakes (more than 175!) whose recipes are so carefully crafted and lovingly detailed that they will work beautifully even in the hands of the most inexperienced novice. Instructions are crystal clear, and Maida never leaves room for any ambiguity to creep in and spoil a recipe. She doesn't always tell you WHY a particular step is performed (unlike Rose Levy Beranbaum's "The Cake Bible"), but it always works. (If she did explain, I imagine the book would be twice as long, given how detailed her instructions already are!) As a book for learning the art of baking, I think it needs to be paired with something else as well to make up for the lack of explanation (Why a tube pan? Why the bottom third of the oven? Why 350 degrees here but not there? ), but it is a rich resource indeed. The book has a number of typos, surprisingly, but they do not affect understanding of the recipes (thank goodness). There are, however, few concessions to health and diet -- the main thrust is delicious cake, but the enthusiatic reader can still find some healthy choices (like the marvellous Zucchini Loaf, butterless and low in cholestrol, yet marvellously moist and delicious). I haven't been able to make all the cakes yet, but I definitely intend to. A million thanks to Maida Heatter for this gem of a book -- you now have a fan for life in me! I owned an older edition of this book and eagerly bought this newer one when it became available. Maida Heatter is one of those cookbook writers who is as enjoyable to read as to cook from. I consider this book the diametric opposite in style to Bevelyn Blair's cake book, which is also a great book. Whereas Blair's book is sleek and substantial with virtually no 'fat' in the writing, Mrs. Heatter has a story to write about each of her recipes. For those who only want the recipe, no brag, just fact, buy Blair's book. However, if like me, you enjoy learning some background on a recipe, this book is up your alley. Mrs. Heatter freely admits mistakes and trials leading to the recipes, and I suggest the buyer take those to heart. Like another reviewer, I've tried tweaking some of her recipes, to my regret. She has obviously worked long and hard on these recipes and has perfected these through trial and error. Many of the cake recipes in this book involve several steps, and can get quite complicated, especially for a novice cake baker. This is where Mrs. Heatter really shines. Her instructions are explicit and detailed. Few things are more frustrating than receiving a new recipe where the instructions leave the baker guessing steps. Not a problem with Mrs. Heatter! Though some of the instructions will be redundant to the experienced baker, I think it's much better to get too many instructions than too few! The English Madeira cake is a jewel, possibly the best all-around pound cake I've ever baked. Her 'best damn lemon cake' is awesome in its overwhelming lemon-y flavor, a golden jewel that's certain to fly off your serving plate. Mrs. Heatter also recommends having a stand mixer with two bowls and sets of beaters (she's a Sunbeam user). I'd recommend the same for these recipes--two bowls will cut down on the rather long preparation times. Also--use bread crumbs like she recommends rather than flour for pan prep. It really does work, and work well. I just had my first succes from this book, and it is called the old fashioned coconut cake. A delicious cake, sophisticated in it's simplicity. The book is written in a very friendly and encouraging matter, the description of the techniques and what to expect during the proces of creating your master pieces give you all the confidence you need to bake an excellent treat for any occasion. The recipes vary from pound cakes to layer cakes with frostings and from cheesecakes to sweet breads and yeasted sweet treats. Had there been some pictures, I would have given it 5 stars (I like the visual aspect as an extra inspiration). But the recipes definately deserve 5 stars in itsself. 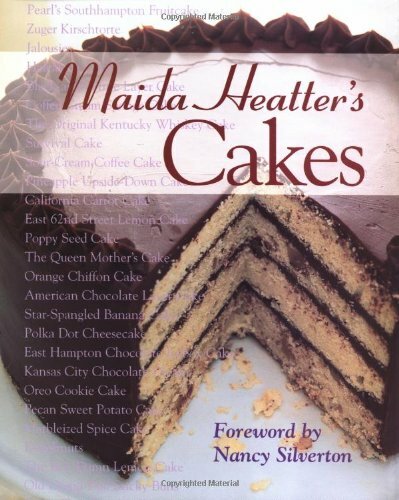 Stated simply, there are no better dessert cookbook writers than Maida Heatter. I have five of her bookbooks and from pleasant experience know that she has no bad recipes in any of her books. This one is no exception. If you can read English and own an oven, I'm not sure how you could possibly screw up one of these cakes. Ms. Heatter spends two to three pages on the simplest of cakes. She tells you where to place the rack in the oven, how many minutes to beat the sugar and butter together and what the batter will look like. For example, in the recipe for Cranberry Upside-Down Cake on page 201, she says: "The mixture might appear slightly curdled--it is okay." I'm happy to say I cooked this cake for the first time a few days ago. My friends thought it was wonderful. The best lemon cake I have ever baked and/or eaten has to be East 62nd Street Lemon Cake(page 22. )Over 20 years ago, when I had never melted chocolate in my life, I cooked a perfect Queen Mother's Cake (pp. 54-56. )The Robert Redford Cake(59-61)is a wonder to behold. Then there is the Oreo Cookie Cake, and on and on they go. There are sections on all kinds of cakes here: plain cakes, chocolate cakes, layer cakes, fancy cakes, cheesecakes, fruitcakes, cakes with fruits and vegetables, yeast cakes, sweet breads and more. And all kinds of tips-- even how to wash a pastry brush. There are no photographs in this book but who needs them? Your own cakes will be pretty enough to photograph. If you own other Heatter cookbooks, be forewarned; these recipes have been previously published in two of the author's earlier dessert books but here the cake recipes are all together. I must admit that I find the cheesecake recipes-- at least most of them, a little over the top. I suppose that's because cheesecake recipes have been anthologized to death and Ms. Heatter sought out the most exotic ones. And I, being a lazy cook, an unwilling to fool with baking a cheesecake in a pan of water. Having said that, if I could have only one dessert cookbook, it would have to be this one. Buy This Book for nothing else but pages 176-179! This is by far the VERY BEST Carrot Cake with Cream Cheese Frosting Recipe you will ever try! Not only did my Mom try it years ago for parties etc. but she handed the cookbook down to me, and I used this recipe for a "Groom's Cake" for my then fiance, soon to be husband. 18 years later, it is still his very FAVORITE Cake of all time. This recipe is a doozy...lots of ingredients, and it does take some time to put it together, but believe me, it is worth every minute of the baking experience. Maida Heatter's directions are so easy to understand and the cake itself is foolproof! That's not to say that this is the ONLY FABULOUS recipe in the book, far from the case! This book is a treasure trove of wonderful dessert cake recipes. You will not be disappointed. Since 1973, The Moosewood Restaurant, well off the beaten path in Ithaca, NY, has been demonstrating how exciting vegetarian cooking can be. Their excellent use of seasonings and the variety of their multiethnic menus have influenced chefs all over the U.S. Customers come from all over the world to dine at this shrine to natural foods at their best. 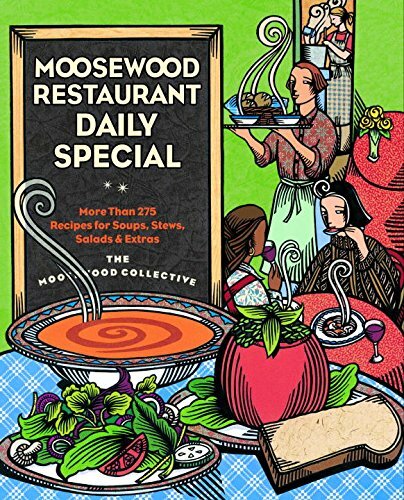 The collective running the restaurant, whose members put together The Moosewood Restaurant Daily Special--their eight cookbook--spread meatless inspiration to home cooks, too. At the restaurant, everything on the menu changes every day, except the daily special, which consists of a bowl of soup, a salad, and a hearty slab of bread. Here, in more than 275 recipes, you can have comfortable, easily prepared ethnic adventures inspired by places in every corner of the globe, from Tibet to Cuba. Beginning in the east, there's Asian Bean Curd Soup, based on a rich broth, and fanciful Balinese Rice Salad, made with brown rice and a zippy, chutney-spiked dressing. Moving west, you find briskly chilled Golden Gazpacho, made using mid-summer's sunny, yellow tomatoes, and Alabama Hot Slaw, a classic cabbage salad doused in a warmed-up dressing. For accompaniments, there are cloud-light buttermilk biscuits, vibrant curried croutons for enlivening soups and salads, and nine of the restaurant's most popular salad dressings. Every recipe is accompanied by information-packed notes about its ingredients, a nutritional analysis, suggested accompaniments, and alternatives, such as adding grated cheese, rice, or shrimp to Pepperpot Soup, a stew of greens, sweet peppers, tomatoes and potatoes, spiced with a Caribbean blend of thyme, cinnamon and chiles. Like to cook? I mean, like discovering new seasonings and playing with interesting ingredients? If so, THIS BOOK IS FOR YOU! Don't be dismayed that the recipes are all soups and salads. Those are very broad categories! Many "salads" are more like casual meals (such as Bean Puree with Seven Savories, which is pretty much a really cool Middle Eastern-style nachos, using toasted pita wedges instead of tortilla chips, of course). And as for soups... there are SO MANY different recipes here, no matter what your idea of soup may be when you open this book, it'll have expanded ten-fold after you've perused these pages. The best part is, soup and salad are such forgiving mediums, this book is perfect for the home chef who wants to explore. Helpful text explains unusual ingredients and describes why certain vegetables & seasonings were chosen to enhance flavor and texture in each recipe. At the bottom of every recipe, the Moosewood editors were kind to include a half dozen or so dishes that would compliment it nicely. Makes meal-planning a snap, and so far, they've been right on target, every time. I got this book for Christmas and many of the recipes have already become "regulars." I have no qualms about trying new dishes, even when serving guests, because you can trust these recipes to need little, if any, tampering. Though I have several Moosewood cookbooks (and I like them all), I can't recommend THIS book enough. Really! Oh yeah, and I wanted to also mention that Moosewood also includes time estimates & nutritional informaton for every recipe. gotta love that. This is my favorite cookbook ever! You know how most cookbooks start off with appetizers, beverages and end with dessert? Well, if you're like me and definitely don't need a recipe to fix a beverage and don't want another dessert idea, this is the book for you! First, the recipes are fairly simple. Sure, there are a few exotic ingredients thrown in, but most are easy to find and these dishes don't require a lot of steps. Third, these are refreshing recipes! Who wants another recipe for mac and cheese or potato salad??? I loved the Welsh Rarebit soup. The Baked Bean Soup and French Pasta Salad (with crumbled cheese and toasted hazelnuts) were also hits at our house. Fourth, there is a small section at the back that includes some interesting supplemental recipes...croutons, quick breads, etc. They're great, and the soup and salad recipes include references to these in case you have a few extra minutes and want to make your meal really special. I use this book on a weekly basis and always find something tasty. Kudos the the Moosewood staff for giving us health-conscious folk some more ideas for dinner. I've purchased this book as a gift for others and would recommend it without hesitation. The recipes are reliable and easy to follow. Personal favorites: Butternut squash soup with sizzled sage, Jamaican tomato soup, Spicy carrot peanut soup, Black bean and chipotle soup, Tortilla soup, Corn chowder, Cream of mushroom, and Creamy herbed potato. There's a large chapter on salads. Try the Asparagus and fennel pasta salad, Caesar salad, Chef salad a la Moosewood, Tomato flowers and the Tostada salad. At the end of each page it will give menu ideas as to which salads go with which soups. Very helpful. Their salad dressings are very good but my all time favorite which I make once a week is the Moosewood house dressing. A delicious combination of canola oil, cider vinegar, honey, spinach leaves, basil leaves, dijon mustard, a little salt, fresh ground black pepper and buttermilk. All whirled together in a blender and tossed on fresh greens. It will keep in the fridge for about a week. This book is about soup, salad and sides. The soups in this cookbook are imaginative and delicious! 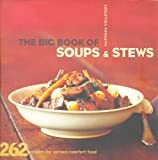 Being a vegetarian and loving soup I always get bummed because nearly all soup in restaurants is made with Chicken or Beef stock, with this book I can have soup as much as I want! I have made some of the salads, which were good and several salad dressings which were very good. There are several deterrants from purchasing this book 1. You absolutely need to have a cupboard full of exotic spices 2. You can't be intimidated by long ingredient lists 3. Everything seems to be pureed (best advice-get a hand mixer-cuts time, work and clean-up) 4. Many recipes call for expensive cheese (not good for budget or vegans). If none of this seems daunting then again this is a fantastic soup book. Plus, if you make a big batch it lasts for several days-no cooking! Everything i have made has been oustanding! If you can't get to the restaurant, get this book! As a former student at Cornell University, I had the distinct pleasure of being able to dine at the Moosewood Restaurant from time to time. Unfortunately, my journeys have taken me away from Ithaca, but this cookbook brings me back every time I open it. As a lover of soup, I find this book fabulous. There are so many distinctly varied recipes originating from all cuisines that I find it refreshing over your typical cookbook that often hails from one culture. For the most part, the recipes are very easy to follow and you won't have to go to some crazy health foods store to find the ingredients like a lot of other vegetarian cookbooks. 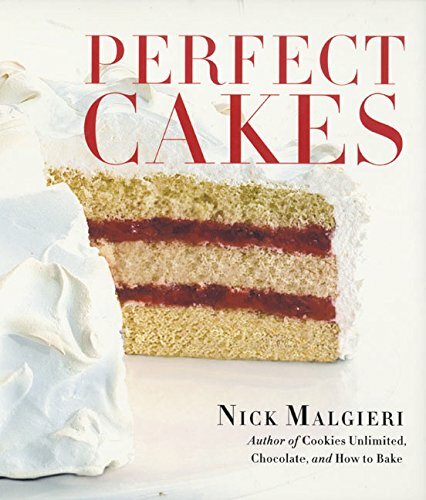 Covering cheesecakes, chocolate cakes, fruit cakes, rolled cakes, filled cakes, meringue cakes, nut cakes, coffee cakes, sponge cakes, and pound cakes, not to mention frostings, fillings, and glazes, Nick Malgieri's Perfect Cakes is a "product of a lifetime of collecting and baking." Malgieri is a much acclaimed cookbook author (Cookies Unlimited), pastry chef, and baking instructor, so he's had a lot of practice presenting recipes in a way that makes them easy to follow. The informative chapter on ingredients and equipment will get you started. Ingredients and baking equipment for each recipe are listed in a yellow box; steps are clearly numbered and storage instructions follow every one. As for recipes, the ones I have tried turned out absolutely fantastic! I made the 'Orange Sponge Cake' last week and it was extremely light and fluffy, and the flavor was outstanding. I made the 'Lemon Meringue Cake' today and my co-workers are raving about it. I'm going to make it for an upcoming bridal shower - it turned out beautfully. However, I have to agree with the first reviewer 'oktober31' on the lack of some details in the instructions. I had to rely on my past experiences for things like 'how much to whip the meringue? ', and 'should the eggs be at room temp or cold? ', etc. These seem like small details, but when it comes to baking, we all know how important these small details become! While I'm not a beginning baker, I am relatively new to world of cake baking. I borrowed this book because of the cover picture honestly, and was immediately intrigued by all the recipes in this book. -the introduction chapter which talks about the importance of various ingredients, baking skills, utensils, etc. -the lack of descriptions of the mixtures you are making. I had trouble with a few recipes... Other recipes have the "as you go" descriptions I find very useful. An experienced cake baker may know what to look for, but I do not! I made the cover cake tonight (strawberry meringue layer cake) and the author's recipe for meringue fell flat for me. I had to resort to a Pillsbury recipe for a lemon meringue pie I had previously made. However, the cake and strawberry filling was easy to follow and tasted great. If you are an experienced cake baker, then I would suggest buying this book. You will probably be able to figure out alot that I can't at this point! I do intend to make more from this book, but maybe after making cakes from other books. If you are not so experienced, as I am, hunt around for other dessert cookbooks. 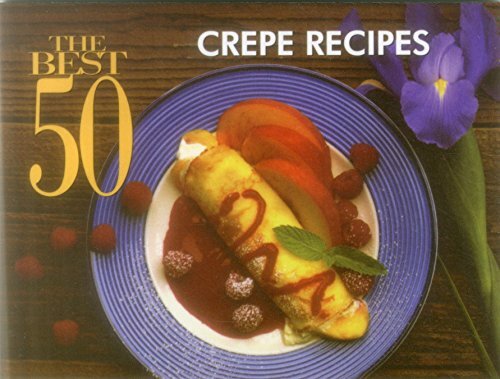 Le Cordon Bleu makes an excellent dessert book for amateur and experienced cooks alike! Mr. Malgeiri has done it again! This very well-written baking book illustrates quite clearly each and every recipe by the notes and reminders of the author. I have done the Perfect Chocolate Cake twice already, including one of the ganache frostings and they came out really perfect each time. This book will be appreciated by home bakers like me, because the instructions are very clear and precise. It is surely a welcome addition to one's collection of excellent cookbooks. If Maida Heatter is the queen of cakes, as Mr. Malgieri calls her in his dedication of this beautiful cook to her, then he must be king. This is the third dessert cookbook of this author I own, and-- forgive the pun-- he just gets batter and batter. Mr. Malgieri tells you practically everything you ever needed to know about baking a cake. There is information on ingredients, equipment, sources, a bibliography, all kinds of different cake recipes, as well as information on frosting and decorating. (For example, now I know that one cup minus two tablespoons of all-purpose flour equals one cup cake flour.) I marvel that at this late date there are still new cake recipes to be had. This book is full of them. And in keeping with my theory that each book should have at least one dynamite recipe, the green tea pound on page 42 makes the cut. I'm pleased to say that a slice tastes great straight from the oven with a glass of cold milk. In addition to this great recipe, there are certainly many others I want to try. What's the best meal of the day? For many of us, it's breakfast. Saluting that fact is Cheryl Alters Jamison and Bill Jamison's A Real American Breakfast, a collection of 275 traditional and innovative recipes that cover breakfast comprehensively and in the best taste. Breakfast often competes with a tight morning schedule, which the book acknowledges by offering recipes that can be prepared the night before; regional, caf&eacute;, and bed-and-breakfast favorites are provided, as well. Dishes range from familiar eye-openers like waffles and cinnamon toast to less conventional fare like Salmon Croquettes and the Maple-Glazed Ham, Cheese, and Leek Sandwich--food that can also be enjoyed throughout the day. The Jamison's have done it again. They have another hit book about food. Notice I didn't call it a cookbook. It surely is a cookbook but it is so much more. This book is a blend of great recipes, nostalgia, and beautiful pictures. This brings you back to a time in our lives when we ate breakfast as a family instead of a fast food drive through. Those smells that you used to wake up too seem to resonate from the pages. The recipes have been good for me to get my family together for those week end breakfasts once again. Also, we have week end guests quiet often and it is so nice to have such a variety of recipes to choose from vs the usual breakfast stand bys. In this time when we all seem to be sreaching for comfort foods, this is the best cookbook I have found. "A Real American Breakfast" is also a Real cookbook. The recipes are delightfully varied, drawing from our country's diverse heritage, and are also geared for busy cooks. They are quick and uncomplicated, as breakfast cooking should be, using easily obtainable ingredients. A quick thumb through the cookbook inspires one to get up a little earlier and fire up the stove with delicious results all but guaranteed. An excellent, fresh approach to America's forgotten meal by two of the best cookbook writers today. I just bought this book at a bargain price, not expecting much from it. Boy, was I surprised!! This is a really good book full of original recipes, not your usual waffle and pancake breakfast cookbook. The pictures are absolutely beautiful, and the recipes look delicious. For the cookbook collector, this is a must. This cookbook has recipes from across America. It has recipes that are the old traditional such as pancakes and runs the gamut to recipes from various parts of the country. The recipes do not generally call for any out of the ordinary ingredients, they are easy to follow and the end results of every recipe I have tried turns out great. The pictures are lovely. The pages are uncluttered and easy to read. However, I particularly like that there are sidebars with interesting facts, menus from eating establishments say from the 1940's, etc. It makes for an interesting read as well as a nice cookbook. This is the cookbook I regularly turn to when picking out what I'm going to make for breakfast. It is well worth the money. Most breakfast cookbooks are top-heavy with variations on the usual: lots of waffles, omelets, home fries, and muffins. This one is unique, because it collects a set of recipes you *wouldn't* have thought up on your own. For instance, it's the only book in which I've found a recipe for goldenrod eggs (hard boiled eggs in a cream sauce, served over toast, with grated egg yolks and paprika sprinkled on top) except for a 1942 WWII-era pamphlet my mom had. It's the only recipe I've found for dutch baby pancakes -- sort of a cross between a pancake and a sweetened popover, traditionally served with lemon and maybe a sprinkling of confectioner's sugar. Aside from completeness, the recipes are clearly written, entertaining (with sidebars that include breakfast menus from, say, a 1904 hotel menu), and educational.